One of my first experiences with EFT was using it with a my gardener, who was allergic to pollen. Imagine my surprise when her clogged sinuses cleared after three rounds of tapping. There are many accounts of allergy sufferers overcoming their symptoms after just a few minutes of tapping. Try it for yourself and see! 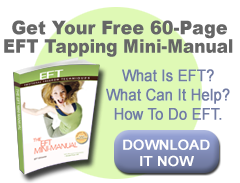 You can get started for free with the EFT Mini-Manual. To go further on your EFT journey, take an EFT workshop, book a session with one of our certified practitioners, and read one of the EFT books available at our bookstore. There are also a number of allergy resources built into our handy EFT for First Aid online course, which gives you quick-start resources to use when an emergency strikes. It offers fast help not only for allergies, but for cuts, bruises, stings, nausea, and other common sources of pain and discomfort. Best-selling Author of the Award-Winning Book The Genie in Your Genes.